Great news for anyone who currently owns a Mac: Apple’s newest operating system update, OS X 10.9 Mavericks, will be offered for free to all Mac users regardless of your current operating system. Another surprise: It’s available for download today. Some of the best improvements to be found in OS X Maverick aren’t visual, they’re technical. Refinements to the way your computer uses power will boost battery life up to 90 minutes when watching iTunes video. A new feature called Compressed Memory will help you get more out of your RAM, fitting 6GB of data in 4GB worth of space. Mavericks even comes with a graphics boost, using far less memory when possible. 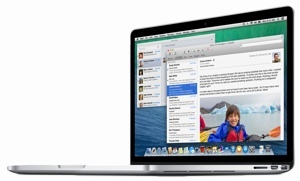 You’ll find some iOS 7-inspired software changes in Mavericks, too. Apps can now update on their own, like they can on your smartphone. The new OS X Calendar app is as sleek as the updated iOS version, Finder search now offers tabs and tagging and Safari is more social. There’s a new desktop version of Apple Maps and a new iBooks app. And if you’ve been frustrated trying to get multiple displays to work with Mountain Lion, Mavericks has the cure: Apple’s newest operating system can handle full-screen on your second monitor without issue. Of course, the true killer feature of OS X is its lack of a price tag. It’s a hint at a future where operating systems are simply a free part of the computer you buy, much the same way mobile operating systems are handled. It’s also a direct attack on Microsoft’s Windows 8, which currently costs more to own than many mobile devices themselves. OS X 10.9 Mavericks is available for download today as a free upgrade for all Mac users. For more on OS X Mavericks and link to the App Store for downloading, visit its page on apple.com/osx.